Black poets have written about enslaved people and struggles for liberation for well over 150 years now. Figures such as Paul Laurence Dunbar, Robert Hayden, Margaret Walker, Lucille Clifton, Amiri Baraka, Evie Shockley, Kevin Young, and many many others have written about the subject. Contemporary poets have continued and extended the poetic practice by producing extended series and book-length volumes about discontent slaves, runaways, and insurrectionists. Elizabeth Alexander's "Amistad" -- first published in The South Atlantic Quarterly (Summer 2005), soon after as the third section of her book American Sublime (2005), and then again in Crave Radiance: New and Selected Poems 1990-2010 (2010) -- represents a standout series in the writings about slavery. Alexander offers various kinds of poems (persona, haiku, descriptive or documentary, lists) as she provides a multi-part artistic chronicle of the experiences of the Mende rebels and captives, the Amistad, and the poet's engagements with the events during modern times. Ultimately, Alexander versifies a significant historical moment, offering the internal musings of Cinque, the rebel leader, and other key figures associated with the Amistad rebellion and aftermath. In "Teacher," Alexander writes from the first-person perspective of Josiah Willard Gibbs, who learned to count to ten in Mende in order to go to the New York docks to attract the attention of an African capable of speaking English and Mende. In "Translator," Alexander assumes the persona of James Covey, who translated the captive Mende's experiences into English. In "The Girls," Alexander writes about Margru, Teme, and Kere, "the three little girls onboard" the Amistad, who eventually returned to Sierre Leone, and one of whom returned again "to America / to attend college at Oberlin." In addition to representing brief and poignant portraits of key figures associated with the Amistad, Alexander offers a compelling glimpse concerning the strained processes of Africans becoming Americanized, the early, hard-earned development of double consciousness. In one poem "Absence," she even speculates about the origins of the blues. "When the ship reached the point where no landmass / was visible in any direction," writes Alexander, "who first hummed that deep / sound from empty bowels, roiling stomachs," "who found the note that would soon be called 'blue'"? Alexander's series of poems is the vital connector between Robert Hayden's "Middle Passage" and Kevin Young's Ardency: A Chronicle of the Amistad Rebels (2011). 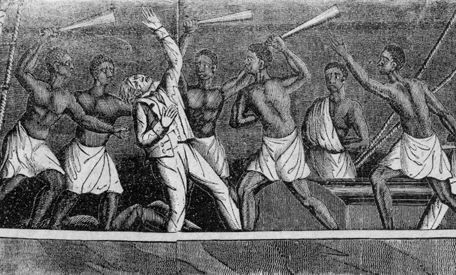 Further, Alexander's "Amistad" is a significant contribution to the extensive body of works by black poets concerning the experiences of enslaved people and rebellious ex-slaves, and her series constitutes a poetic treatment of an early moment where captive Africans fought for freedom in America.